Everyone's favorite pups are pack as Disney's animated classic continues - now more exciting than ever for the first time on Blu-ray and digital HD! Feisty little Patch feels almost invisible alongside Lucky, Rolly and the other puppies, so he cleverly figures out how to make his mark. Inspired by his TV hero, Patch bravely leads the charge when cold-hearted Cruella De Vil and spot-obsessed artist Lars plot to round up all the Dalmatians in London. As Patch and Thunderbolt embark on a quest to save the dogs from Cruella, they discover their inner strengths and prove once and for all that Thunderbolt is a real-life hero and Patch is a true "One-Of-A-Kind Wonder Dog!" 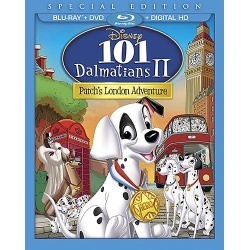 Bring your family together for all the friendship, fun and thrilling adventures in 101 Dalmatians 2: Patch's London Adventure !